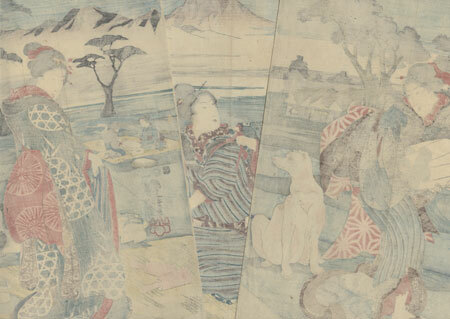 The Cloth Fulling Jewel River in Settsu Province, 1847 - 1852 - Charming triptych of women engaged in fulling cloth along the Cloth Fulling Jewel River in Settsu Province. Tatami mats are spread out on the grass along the meandering path of the narrow river. The woman in the center pounds cloth on a fulling block with a wooden mallet, a process that entangles the fibers to create a stronger fabric. 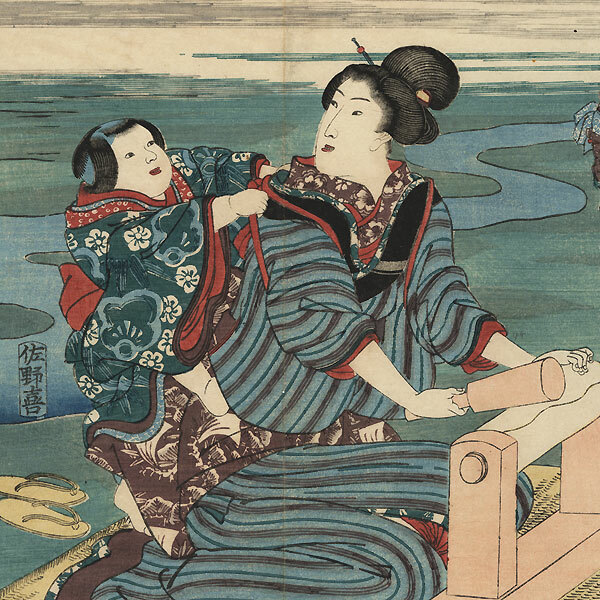 A young boy playfully climbs on her back as she looks over her shoulder at a beauty carrying rolls of finished cloth. Other woman work at similar tasks in the background, with mountains rising above hazy clouds along the horizon. This image is in the collection of the Boston Museum of Fine Arts. A beautiful design with wonderful detail, including two dogs, one lazily resting at right. Condition - This print with excellent detail as shown. Three separate panels. Slight paper remnants on reverse at corners from previous mounting. Vertical fold in each panel. Slight toning and soiling, a few spots and creases. Please see photos for details. Good overall.